As most of us know, the Retro 51 Tornado is sort of like a "gateway pen" into justifying the purchase of a writing instrument that costs more than $20. This is with absolute good reason considering, for the price, that the standard twist-top Retro 51 Tornado rollerball is pretty much the best pen you can buy in its price range. I'd even say it is comparable with rollerball pens of twice (or more) the cost in overall performance and value. With the Snapper...well, let's just say this review might be a little rough. It actually takes a lot for me to be disappointed in a pen. I can often look past a little hiccup in the writing quality or feel of the pen, but can still enjoy it. One thing that is extremely difficult to overcome is when a company sets the bar so high with one of your absolute favorite products and then seemingly brings everything crashing down. This is kind of how I feel with the Snapper. Harsh? Maybe, but I'll expound. 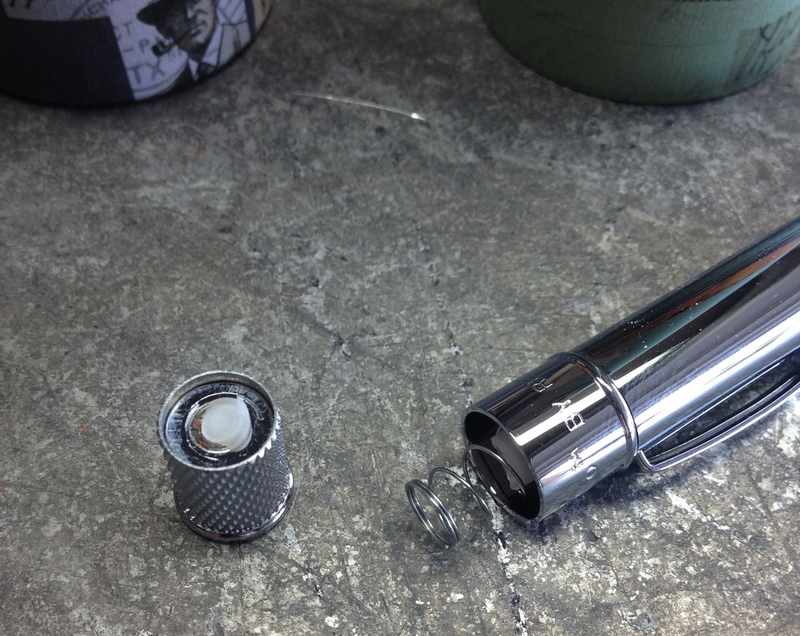 My first experience with the Snapper was actually when the one I ordered came broken. The knock was detached from the pen in unopened packaging (image below) exposing some of the inner workings of the pen. With the normal Tornado, the twist mechanism on the top feels like a brass tank; weighty, substantial, awesome. The knock of the Snapper appears to be held together by a small plastic tube and the overall feel of the pen seems "cheap" in comparison to our beloved rollerball Tornado. First impressions are the best...or worst. A major selling point of the Tornado is its amazing Schmidt rollerball, so how cool would it be to have a click mechanism with this refill? Well, the Snapper only takes a Parker style ballpoint refill. To me this is odd because the standard Tornado can interchange the two, but the Snapper is tied to just the one. This by itself is a reason that I rarely use this pen. If I want to carry a Tornado, I'm likely to carry the one with the rollerball refill as well as the substantial weight and feel I'm accustomed to. Retro 51 has recently changed a few things that have discouraged some customers, particularly their packaging. Until just recently, when you purchased a Tornado it came in a really cool metal tube and had a manual/brochure that was printed on super nice stock. When you opened up your packaging, these little bits made you feel awesome; like what you bought was super important and the company wanted you to know it. Like, "This was a great idea; feel good about it. A lot." New Retro products are shipped in a cardboard tube and the manual has also been slimmed down to a cheaper stock which the company says is to help the environment. I'm down with that, but these changes coupled with a diminished product quality with the Snapper makes me read between the lines a bit? From a business standpoint, these are measures to cut costs which worries me a bit. Although, I will still have faith and purchase from Retro because they are great. Just this past week I recommended the metalsmith series Tornado to three people at work for Father's Day gifts, and I even jumped on the bandwagon and bought the limited Vintage Surf Edition (great review by Mary at From the Pen Cup). I really do want to love this pen, but it has just disappointed me. If Retro 51 ever does read this, know that this review is not a bash on the company, but just an expression of how this pen really missed the mark for me. If I were asked by someone if this would be a recommended purchase, I would have to unfortunately say no.